• Privately owned by the Kean family. • Number of employees: 40. • Cotton product produced annually: 2 million pounds. • Amount of jeans used: 250 pairs per 500-pound bale. CHANDLER – They’ve been sung about by Neil Diamond, Flo Rida and Blur. They’re worn until they rip and tatter, then worn some more. They are your jeans. When your denim is worn to the point where it’s no longer useful as clothing, it can serve another purpose. 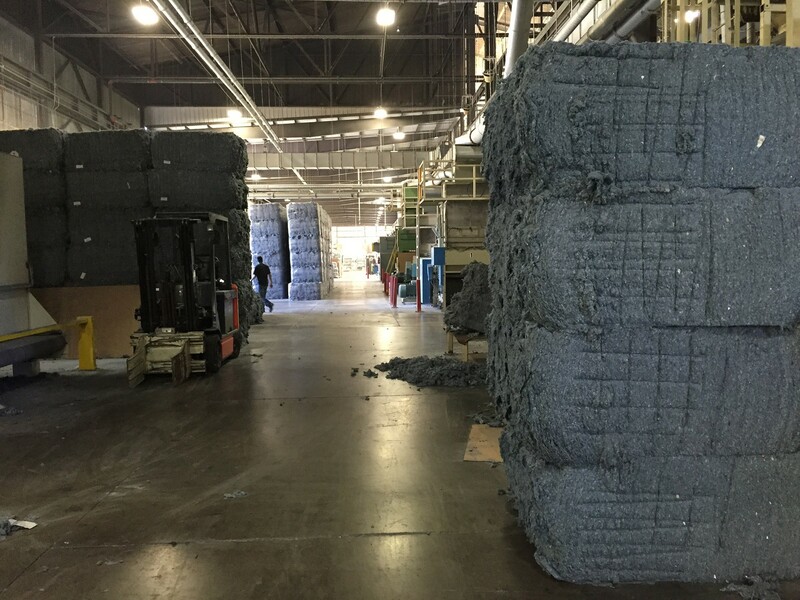 A company in Chandler is taking this evergreen apparel and recycling it to make bedding, wall insulation and soundproofing products. Bonded Logic, with its sister company Phoenix Fibers, collects denim that has been donated, bought in bulk from Goodwill and Salvation Army or thrown away, according to Sean Desmond, director of sales and marketing for Bonded Logic. The average pair of jeans weighs about 2 to 3 pounds. Bonded Logic goes through about 150 pairs of jeans per 500-pound bale and produces more than 2 million pounds of cotton-based product annually. The Bonded Logic UltraTouch insulation is made up of 80 percent blue jeans, according to Desmond. The remaining 20 percent includes a flame-retardant chemical treatment, binder fibers and other cotton materials like raw cotton or cotton from underwear and socks. Insulation can be made up any combination of materials like fiberglass, cellulose, slag wool, rock and foam, to name a few. Products made from these typically have a 30-year life span, Desmond said, the same as the recycled jean insulation. There is a cost discrepancy, however. The Lowe’s online store has listed the prices of a 163-square-foot batt of Johns Manville fiberglass insulation for about $70. 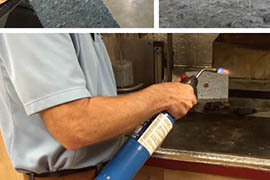 The same quality of UltraTouch denim insulation from Bonded Logic – R-13 – costs $51 for just 77.5 square feet. This may be a moment where buyers get what they pay for, Desmond said. What his company’s products lack in attractive pricing they make up in quality, superior acoustic properties and reducing users’ carbon footprint, he said. Mick Dalrymple, senior sustainability scientist at Arizona State University’s Julie Ann Wrigley Global Institute of Sustainability, said that while Bonded Logic has led the movement for cotton insulation, large fiberglass manufacturers are narrowing the eco-friendly gap by using recycled fiberglass as well as cellulose comprised of recycled paper. 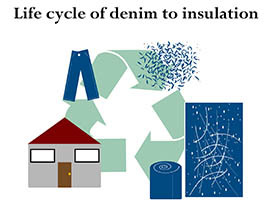 Though Dalrymple said he doesn’t believe cotton insulation will ever overtake fiberglass, he does believe that denim insulation will become more popular and profitable as more people learn of its existence. Dave Stanciu, general manager at Bonded Logic, said that making recycled products goes further than being higher quality and more user-friendly. He said that he likes to practice what he teaches his children by giving back. 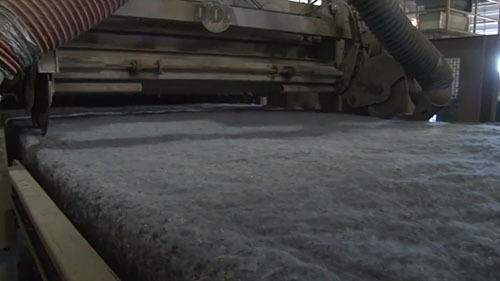 A Chandler company is marketing a new type of eco-friendly home insulation that is made from old jeans. Bonded Logic told reporter Megan Thompson its denim insulation works just as well as traditional insulation, but without the chemicals and irritants those products may contain. Experience Bonded Logic's operation through this PicPlayPost compilation. 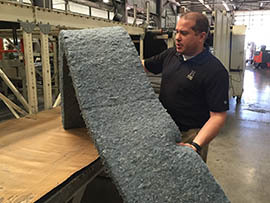 Sean Desmond, director of sales and marketing for Bonded Logic, shows the Chandler company's insulation made from old blue jeans. Bales of material made from recycled blue jeans at Bonded Logic in Chandler. See a graphic explaining the life cycle of jeans made into insulation.